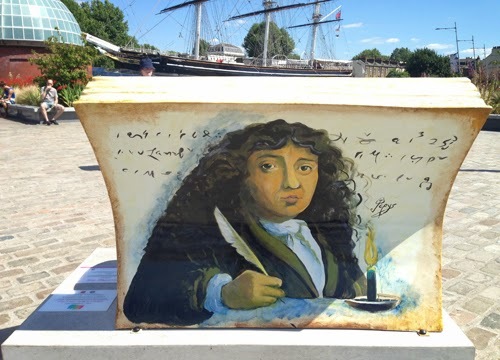 If you've been in Greenwich recently, you'll have come across the 'book benches'. 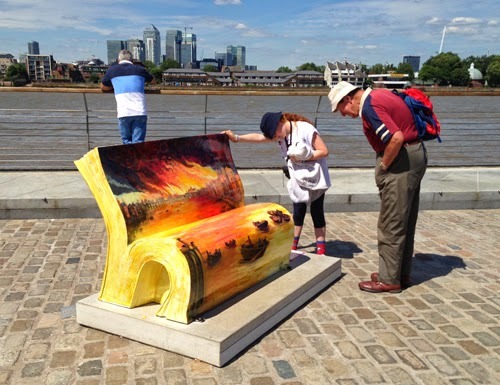 Organised by Books About Town, there are 11 benches in Greenwich situated around the town, in the park and by the river, as part of the Books About Town Greenwich Trail. The benches are all designed by local or famour artists and based on literary tomes relevant to the area where they're placed. There are four Trails (Bloomsbury, City, Greenwich and Riverside). One of the best situated – and most sat-upon, admired and photographed – benches is right by the river in Cutty Sark Gardens and we're proud to say it's by long term Crossfields resident, Michele Petit-Jean (pictured by her bench above). 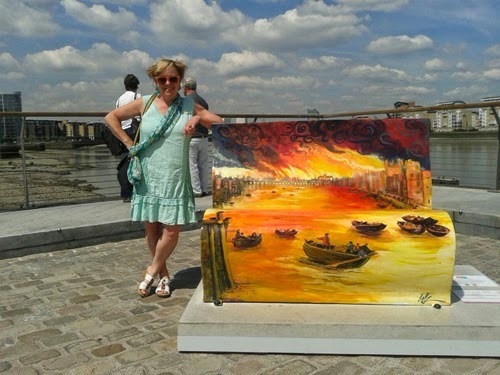 Illustrator, puppeteer, author, musician and multi-talented artist Michele chose to illustrate Samuel Pepys' Diary with a marvellous rendition of the Great Fire of London, which Pepys recorded at the time. All the BookBench sculptures will be sold at public auction on 7 October at the South Bank, with proceeds going to the National Literacy Trust. 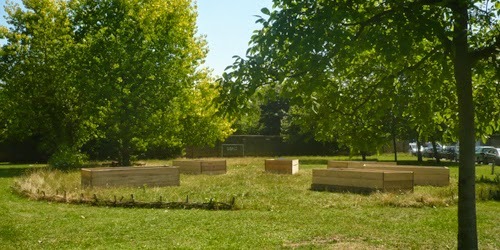 As reported in our previous post last Friday, the community garden which has a lease on the open land next to St Paul's Church planned to begin building their garden last weekend, but Thames Water's proposals to dig exploratory trenches in the area threatened to scupper their schedule. 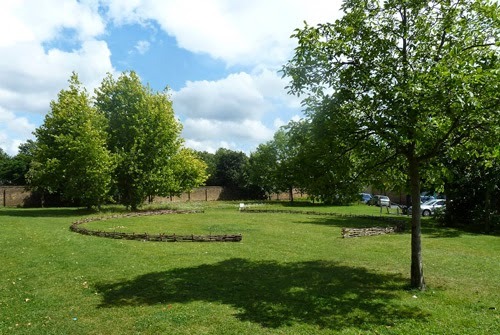 'Deptford's Open Garden' will hold a Ceremonial Opening this evening at 7pm. Everyone is welcome to attend. It will be a lovely evening – bring a bottle and refreshments, a friend or two, blankets, musical instruments, outdoor games stuff, and enjoy this bit of open green space before it's gone! Arrive at 7pm sharp for a press photo call, if you can! Since the news, the gardeners have negotiated with Thames Water to keep the willow circle space accessible during the works. TW's 5-week programme of digging exploratory trenches was postponed from Monday but will start tomorrow, so this is the last chance to see and use the space before it is fenced off and works start. Locals have been opposed to Thames Tunnel's proposals to build a shaft for the super sewer on this site and wished it to be kept for communal use. The Secretary of State is still to decide on whether Thames Water (aka Thames Tideway Tunnel) can have permission to use the site. In the meantime, with TW's full co-operation, the gardeners can start growing stuff alongside the company's trench digging. Although the Secretary of State has yet to make a final planning decision on the sites chosen by Thames Tideway Tunnel for all the works required to build the super sewer (expected in September), this doesn't stop TTT continuing to investigate the site on Deptford Church Street. 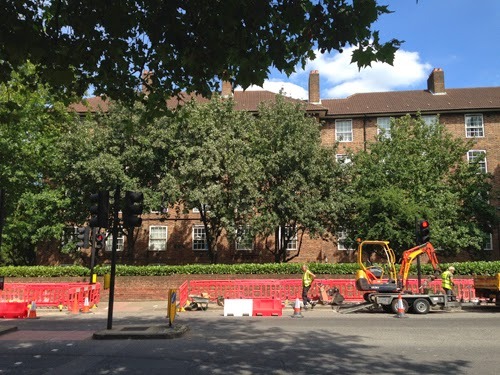 Last week Crossfields residents got a letter from TTT informing us that they intend to carry out "ground investigation works on Deptford Church Green to locate underground utility services and underground obstructions". There will be seven trial trenches dug to a depth of up to 3 metres, the area would be fenced off, and the work will begin this coming Monday and last 4 weeks. They enclosed a plan (see below). But it seems that Crossfielders may have been the only people to receive this information. The last people to know are Deptford High Street Garden Association, the new leaseholders of a small part of the land, who only found out through their Crossfields friends. 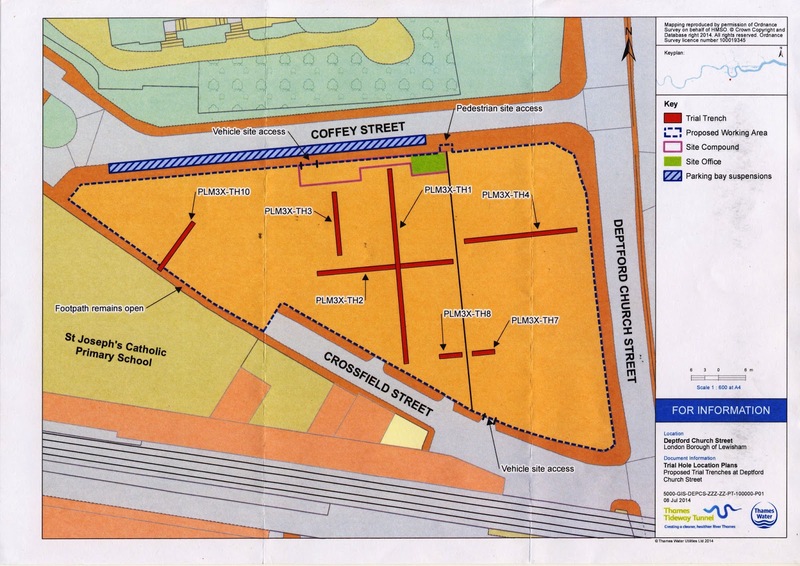 The proposed works rather conflict with their plans to start building their container gardens on the site this weekend. Lewisham planners have agreed to let TTT dig the trenches without either giving the Association any notice. TTT ought to know about the association's intentions since it made several representations during the consultations. Lewisham Planners ought to have known about the Association because Lewisham awarded them the lease to create the garden there. The Association's lease is only for the 'willow' circle area. The circle was built by Utrophia in the summer of 2012 to demarcate the area where TTT want to build their 17metre wide shaft. It was most recently used as a magical after-show dance space by French theatre company Rar Woulib as part of Greenwich Festival in June. From the plan, it appears the trenches are narrowly avoiding the willow circle area. The Association were unable to get hold of anyone at TTT this week until today when they failed to get it confirmed that the circle would be protected. In fact they were told the whole area would get pretty messed up and driven over by diggers, and TTT couldn't guarantee that anything would remain. A case of plant machinery supplanting planting. These roadworks at the Giffin St junction opposite Castell House started on Monday. Traffic is presently reduced to a single lane on the southbound stretch of the dual carriageway. What are they for? We asked the foreman. He told us they're putting in a cycle lane, adjusting the position of the present traffic lights, adding a cycling waiting area to the crossing, widening the pavement (?! ), taking out part of the central reservation on the south part of the junction and adding another set of traffic lights (so there will be two crossings at this junction). He showed us his instructions from Greenwich Council which included a plan of the junction improvements and said he expected it would take about 6-7 weeks. There's no mention of these works, however, on the Greenwich website. Nothing on Lewisham's site either, but a link to Transport for London's list of roadworks across London shows the job with a reference number, plus a start and end date (8th August – only 4 weeks). Neither Browne, Castell or Cremer House residents have been notified of these works. During the day they'll be affected by sounds of drilling etc, and in both rush hours, a slowing down of traffic outside their homes. There may be an increase of traffic in Creekside due to rat running, which will affect other residents. A quick email to Greenwich Council's highway department was responded to with "we aim to respond to your enquiry within five working days". The same query to Lewisham, requesting a copy of the plans, was more forthcoming but not particularly helpful: "The work is being done by Greenwich's contractor as it is part of a larger set or works being carried out, but is being paid for by L B Lewisham. I'm afraid I do not have access to the plans, the officer who is dealing with the scheme is recovering from an operation and is unlikely to be back in the office for another month." But anyway, now you know! The consolation is that the school holidays are starting soon, which usually results in a decrease in rush hour traffic. 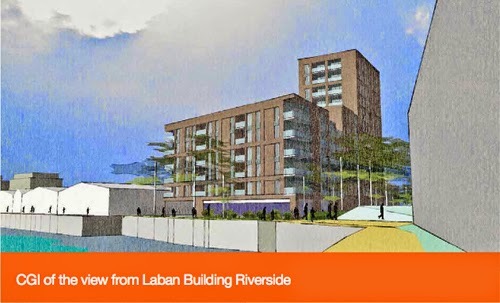 If anyone living in Finch House missed the Bellway Homes consultation held at the Laban on 2nd and 5th July, go to www.kentwharf.co.uk to see how the proposals will affect you. To comment you are asked to download the 'feedback form' and return it by FREEPOST or by email before 21st July. You can also email info@kentwharf.co.uk or call 0845 460 6011 for more information. A detailed planning application will not go in till the end of the summer, when the actual design of the buildings will be more refined – so it is pointless to comment on the look of the buildings in these drawings at this stage. 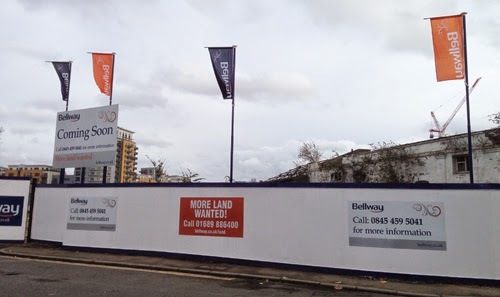 On the website, click on 'to view the exhibiton boards' and scroll down to The Proposals: "Bellway Homes is promoting a residential-led development of one, two and three bedroom apartments along the road (Creekside) and the waterfront. Along Creekside the proposals are predominantly five storeys high with a set back sixth storey, on the waterfront there is a six-storey element. There is also a 12 storey element, which reflects the taller buildings at the south end of the road and across the river. This arrangement helps reduce the impact on the Laban Building opposite." 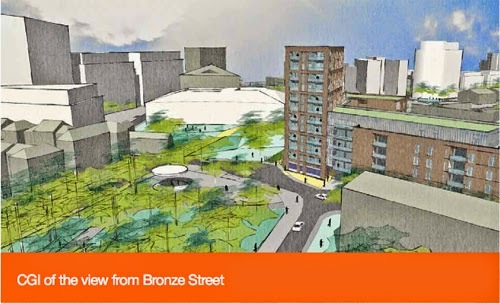 At the consultation we were told the 'luxury' element of the development will be the 12-storey building on Creekside. This is apparently at the request of the council – originally this building was proposed to go on the waterside. The upper floors of the 12-storeys will offer views of both the Creek and St Paul's church and its surrounds. Finch House residents will also be affected by the five storey blocks proposed on the opposite side of the road from them. Of the 134 'private and affordable' units proposed, it was not clear how many will be affordable. We were also told they are 'looking into' using the Creek for the transportation of materials to and from the site. Also there will be an increase in traffic (and parking) from construction workers. Since this will affect us all, we look forward to viewing the reports which will accompany the detailed planning application scheduled for September. 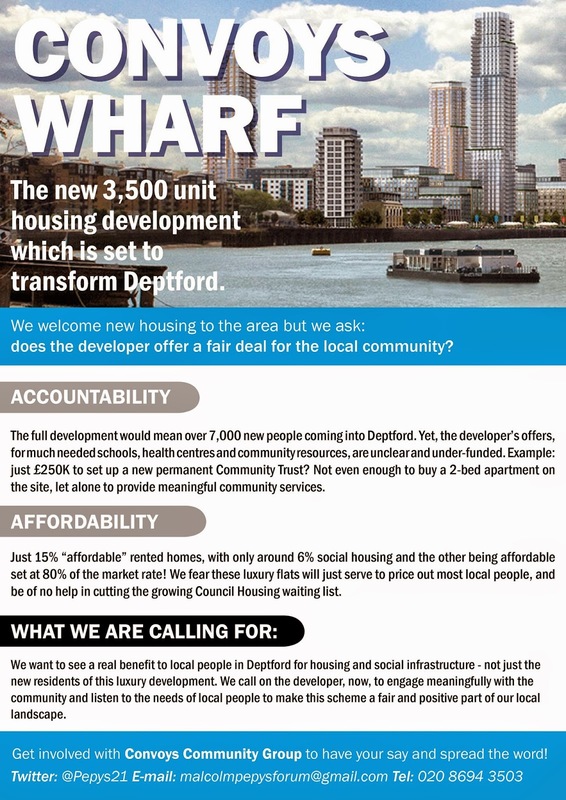 A public meeting was held (and very well attended) on Saturday to welcome people to the future site of Deptford Cinema, currently scheduled to open in the autumn. The not-for-profit project has taken on a shop at 39 Deptford Broadway and will be the only dedicated cinema in the borough of Lewisham! The space is big enough to have a 50-seat theatre, a cafe/lounge area, plus darkroom facilities for film processing and workshops. The His n' Hers mural in Giffin Square is the work of Artmongers aka Patricio Forrester. Patricio is Argentinian. Hence the adornments to the mural today in readiness for the World Cup Final. As usual, Creek Road is at a standstill this Friday evening, with half the traffic including large HGVs rat-running down Deptford High Street and getting impatient when forced to wait to get round the tight bend by Giffin Square, whilst pedestrians are forced to move out the way so that drivers can mount the pavement. One vehicle has even been witnessed cutting the corner by crossing Giffin Square. As if our roads weren't congested enough already, it's about to get worse. 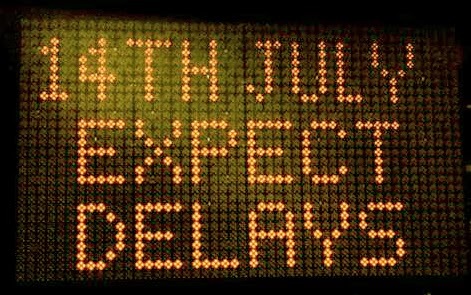 A mobile LED display warns traffic on Deptford Church Street as it approaches the Broadway to expect delays from July 14th because roadworks will be starting at Lewisham's main roundabout. There is also consultation on the project's second phase coming up...see the NewShopper for more details. Now signs have gone up saying "TWELVE WEEKS". It seems roadworks are being phased to "keep Lewisham moving". So expect more of the same over a 20-month period. There's more info at the Lewisham Gateway website, aptly named www.newlewisham.com (or as some are calling it, Newisham). The transport page says: "Construction of the new road layout has been sequenced over an estimated 18-month period to help minimise disruption. While the new roads are being built, traffic lanes will need to be re-arranged and diversions put in place." Lively debate has been going on for the past couple of days on Twitter, Facebook and local blogs over a Guardian Comment Is Free article written by a journalist who has recently moved to the area. Jane Elliot claims, rather late in the day, that naming the new high street bar The Job Centre (after the building's previous use) is an insult to the unemployed. 853 Blog has a great round-up of the row. We cautioned much the same ourselves on this blog when it opened. But we went to the opening, liked it and went back again. Less noisy, smelly and crowded than our beloved local of over thirty years, The Bird's Nest. Cheaper than the Duke and nearer than the Royal Albert. A lot nearer and just as good beer as the equally beloved Dog and Bell. It's great to have a new local and we don't really care what it's called. It's named after what it was. Not like Resolution Way which was once Mechanic's Path. It turns out Jane Elliot is a member of People Before Profit who are always ready to jump on a bandwagon and claim it as their own. She makes some interesting points, but is wrong to say "Older residents see the more affordable stores on which they depend displaced by pricier establishments" – has she been down the high street recently? The latest new 'store' is a pound shop! Efforts to preserve the architectural gems in the street (which some might see as middle class gentrification) are thwarted by careless landlords and businesses who flagrantly ignore any rules about preserving the character of buildings in the certain knowledge the council cannot afford to enforce them. The high street is still a law unto itself. 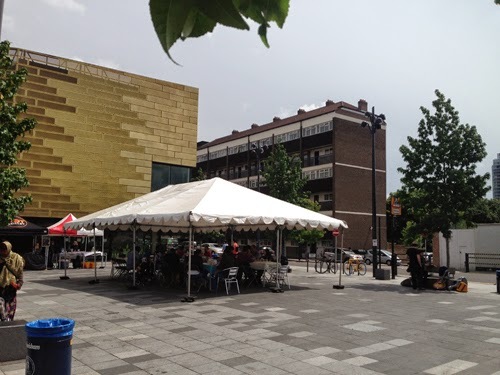 This was the Deptford Brunch Club last Sunday in Giffin Square at around 1.30pm. About 14 diners are eating brunch prepared by Hot Skillet who specialise in tastes from the southern states of the US. This is what it was like at around 11.45am. Empty. More or less what cynical locals expected. It's not as though there was no publicity for the Brunch Club, which had two 'sittings', 10am-12noon and 12noon-2pm. And we've no doubt the food on offer was absolutely delicious. But the ticket price of £12 was a bit much. Even 'foodies' not put off by the ticket price should be put off by the location. Giffin Square on a Sunday has none of the ambience which accompanies the monthly food market that presently runs in the square amidst the hustle and bustle of the Saturday street market. (Although even that was looking a bit sad last Saturday). But the most annoying thing about this enterprise is that it is subsidised by Lewisham Council. "An exciting new pop-up brunch club will open its doors in the heart of Deptford town centre on Sunday 6 July" runs their publicity. "...the latest project by the council to enhance the town centre's morning offer...will see some of London's best chefs and street food entrepreneurs showcasing their culinary brunch menus to hungry locals." Not the hungry locals using the local food bank run by People Before Profit, obviously. The Council are working with London-based 'food portal' The Grub Club which it says "works to support chefs in providing exciting eating experiences in new venues". The lovely Grub Club rep onsite on the day told us the Brunch Club helps young chefs learn how to cook for a lot of people at one sitting. 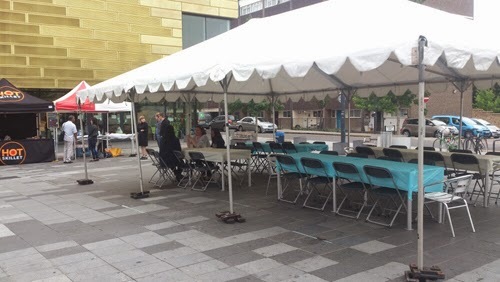 Deborah, the organiser from Lewisham Council, told us they'd had a few teething problems – like flyaway tablecloths – but had 49 people at two sittings. Section 106 money subsidises this series that will run every weekend till the end of October. This is money developers pay to the council to mitigate the inconvenience they cause in their rush to make a profit out of cheap local land (not the official definition). Deborah said the S106 money being spent is for 'cultural activities in the community'. Is that S106 money that's come from a Deptford development? How does the local community benefit from this subsidy when it cost 12 quid to join in (£15 this Sunday, apparently)? In Lewisham, the Dalston take-over of the old model market (the shop shacks next to C&A that have lain empty since 2010 due to plans to redevelop) has been hugely popular with trendy young (and old) people. So much so, they have been queuing to get in on the Friday and Saturday evenings it takes place. Tasty grub can be had for less than £12 (although a drink will set you back), but the main difference between this and the Brunch Club is it is in the evening. You don't really care what your surroundings look like when there's bright lights and music. Such a venture might work in Deptford. But instead we get an expensive breakfast in a barren civic square (that is filthy and stained from the market) on a day-lit Sunday, in full view of passing folk on their way to Iceland for some cheap provisions. 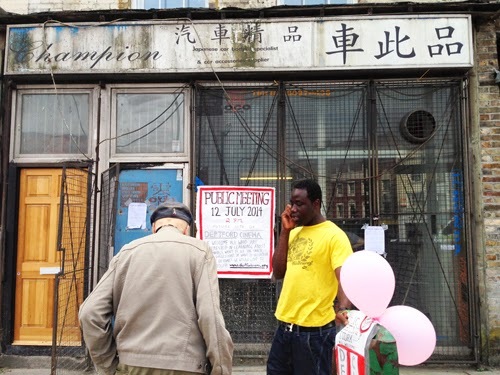 An attempt is being made to redefine Deptford's cultural character to make it more attractive to new businesses and residents. We're already well accustomed to developers and councils using the local artistic output and reputation to add value to their properties and attract money to the area (when in reality the artists are here because it's cheap, and are being priced out along with everyone else). A recently coined phrase is Artwashing: "When a commercial project is subjected to artwashing, the presence of artists and creative workers is used to add a cursory sheen to a place's transformation" says Fergus O'Sullivan in a recent article. Now, it seems, Deptford's scuzzy reputation (betting shops, pawn brokers, street drinking and all that goes with cheap rents and affordable housing) must be replaced with a new buzz where 'art' has failed. Food is the new Art. We are now being Foodwashed. Are we ready for it? Is the Council not getting a little ahead of itself, spending Section 106 money on trendy Shoreditchy stuff for the middle classes that make Deptford appear hip, when there are so many other things it might go on? This arguably misguided Section 106 spending comes when local campaigners are lobbying for more Section 106 money from the Convoys Wharf developers. The GLA, who controversially took the planning application out of Lewisham Council's hands and passed it, allowed the developer to get away with only contributing a miserly £250k to be spent in and by the community. The Council had asked for £2m. Had they got it, Ms Elliot might concern herself with how they see fit to spend the money when they are happy to waste it on an expensive brunch initiative that only the well-off can afford. This third 'surgery' is apparently being held for 'stragglers' who haven't been to any of the two previous 'surgeries' about Major Works at Deptford Lounge. It has not been generally advertised to all. As previously reported, leaseholders on the estate were a bit upset at the lack of information they have received from their landlord, Lewisham Homes, about proposed Major Works – aka external building and decoration works to communal areas. The first 'surgery' was held almost a month after estimate bills were issued, with only a week left before the 'consultation' period was to end (July 2nd). The last notifications about such works were in 2010. It has since transpired that leaseholders did not receive the correct information with their bills. Firstly, a document which usefully outlined Ways To Pay (and when) and gave useful contact numbers was omitted. 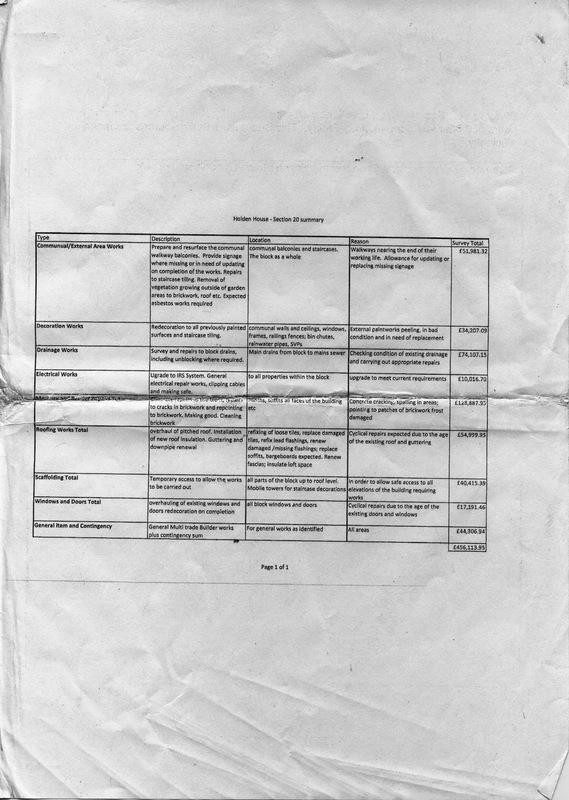 Secondly, a fully detailed and itemised Schedule of Works for each block was not provided. Instead, a 'summary' was included that in many cases was too small to read (see below), was too vague and contained builder's jargon (though not as much as the more detailed version). Other estates have received all this detail in the first instance, but Crossfields people were invited to comment on paying out up to £13,000 with only the flimiest of information to go on. People are required to call up or email to get the full schedule of works for their building, but were not invited to do so. Which is why so many questions were asked at the first meeting. Those who knew to ask for more detail have since received a document dated 25th June (prepared, then, a month after the estimated bills went out). Notes were taken by Lewisham Homes at the first 'surgery' (that had turned into an impromtu group meeting), and were supposed to be sent out to all leaseholders. These have not yet arrived some two weeks later. A promised 'walkabout' has still not materialised. We are now told this will not happen until about 360,000 quid's worth of scaffolding has gone up. The scaffolding needs to go up in order for them to determine what work requires doing to the roofs – something that can't be done with a cherry picker or a pair of binoculars, apparently. The scaffolding will then be up for 6 months or more – a fait accomplis. (Our roofs were renewed less than 20 years ago and should be under guarantee). Although slightly postponed, two blocks have now received notice that scaffolding will go up on 21st July. The other blocks have no idea when the scaffolding will go up around their own buildings. A notice was put up in stairwells on the two blocks yesterday, and today notices were hand delivered to all the flats by the Resident Liaison Officer who is installed onsite. However, no one knows there is a Resident Liaison Officer, since her details have not been provided on any documentation and notices. Only on enquiry was one person told today that work would not start until the roof (and gutters, presumably) have been inspected and further consultation with residents has taken place. Another resident rang LH today and was told the switchboard was jammed with calls and to try again tomorrow. Another resident had been told that consultation ended on July 2nd. Slightly damaged tiles have been filled in with concrete, then covered over with anti-graffiti paint in a nasty swirly stucco paint. Graffiti is not a big problem on our estate (and probably not at Tanners Hill either). Lewisham Homes need only to check their records to see how much graffiti has been removed in the past five years, and compare the costs. The coving on the balconies has long required repainting, as have the wrought iron railings in the stairwells. 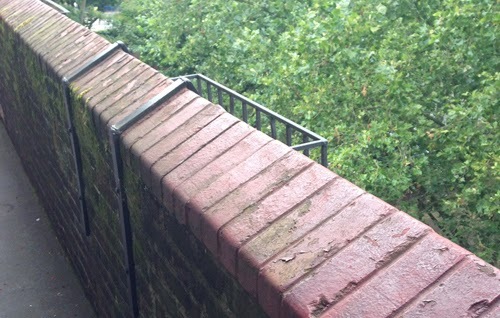 (The railings have mostly deteriorated through the use of a very strong detergent that is used to clean the stairs but is never washed off). 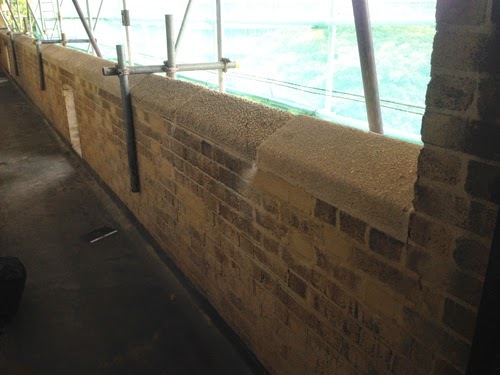 Here's an example of our balconies at present, and the 'repainting' they've done at Tanner's Hill...(not actually paint, but some horrible textured concrete!). Huge professional fees have no doubt been paid to the consultants, Bailey Garner, who deemed this necessary. 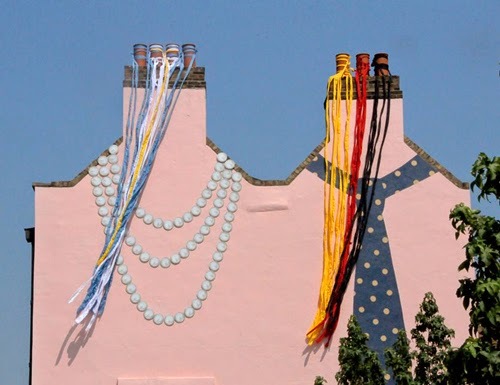 These are just a couple of issues that are worrying Crossfields people, leaseholders and tenants alike – from things that don't need doing to the greatly exaggerated cost of a tin of paint and an hour's labour to paint 7 sq meters (three times as much as it could be). Plus six months in darkness due to scaffolding, for the privilege of a facelift that nobody asked for at a time when no one can afford it. Lewisham Homes charges 10% on the total costs of the work, in some cases an extra £1300 per flat. That 10% is paying for their gross mismanagement on a project which is making a fortune for MITIE. Update: We since discovered that the stairwells and balconies at Tanner's Hill had this work done before MITIE began work on their buildings. 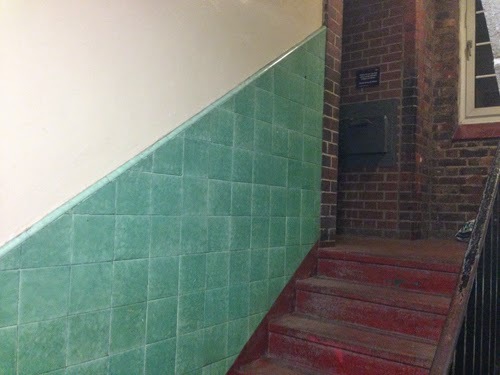 However, Crossfields leaseholders' Schedule of Works still lists "Balcony copings: painting to rough-cast" (rough-cast is non-smooth paint), and all the stairwell tiles were to be covered in more tiles then painted with an anti-graffiti paint, producing a similar result to stairwells at Tanner's Hill. Since we complained and got the Conservation Officer involved (Crossfields is part of a designated Conservation Zone) these items have been modified. The tiles will now not be tiled over and painted. Although tenants will not be asked to cough up for any external works to our communal areas, they may be concerned that MITIE are doing the work, having only just recovered from the internal works – which have met with a large degree of disatisfaction and a great many complaints. As one Castell House resident writes, "Why has Lewisham Homes seen fit to employ again, a contractor whose recent internal works on the estate left so much to be desired? Shoddy work, unprofessional behaviour, bodged work, half finished work, no respect for residents or their homes, mess repeatedly left in communal areas, not turning up on time, leaving early before a job was finished, losing house keys, leaving front doors open in unattended flats…"
Last week a 'surgery' was held for leaseholders. The invitation arrived along with a big fat estimated bill and a rather vague specification about what the Major Works were going to be. A 'surgery' consists of Lewisham Homes and MITIE people sitting behind desks and attendees queuing up to ask questions they probably can't answer. Since a lot of angry leaseholders descended on the 'surgery' at the same time, they demanded that a meeting was held there and then on the spot, since they had a lot of questions – and they all had the same questions! The acting head of Leasehold Services and a senior bod at MITIE were most displeased but were forced to go along with it. Leaseholders have been presented with estimates for the works in varying amounts from £7,500 for each leaseholder in one block to nearly £13,000 in others (strangely the higher amount is for the smallest blocks). So obviously they are hopping mad, especially as the many of the works specified seem not to require doing at all or in some cases relate to items that leaseholders have been paying to have repaired during routine maintenance (but that never get repaired properly). Where preliminary surveys are required (drains, for instance) the survey and the works resulting from it are lumped into one extortionate figure – regardless of what the survey may uncover. Very few questions were answered at the impromtu meeting at the 'surgery' but the combined action of the residents resulted in the Lewisham Homes project manager agreeing to do a 'walkabout' in the near future around the estate with some leaseholder representatives to determine exactly what work is actually required. The date for the commencement of works (which will involve the erection of scaffolding) was also postponed, and leaseholders await an amended and more detailed specification. Crossfields residents are not the only folk unhappy with MITIE. At Tanner's Hill and on other estates, they're up in arms and fed up to the back teeth with MITIE and Lewisham Homes. 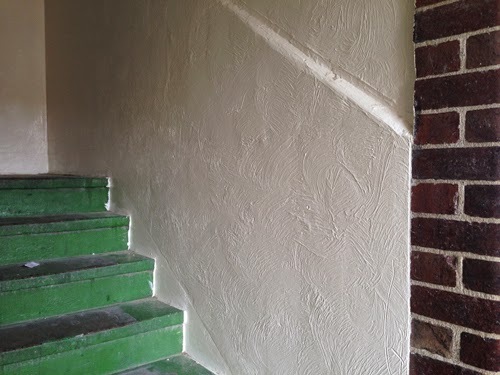 For example, blocks in Tanners Hill have had their stairway tiles recovered and then painted when there is nothing wrong with them (they just need cleaning – something Lewisham Homes seems to have no understanding of). More details on any borough wide group action soon. Bellway Thames Gateway will be exhibiting their plans and proposals 'to transform this derelict site into new homes, a landscaped courtyard and space for artists and small businesses'. The site in question is next to the Laban, close to Finch House.